Dr. Walter Reilly Kane, 91, of Kent, died peacefully on April 29, 2018 at Sharon Health Care, due to complications of heart failure. Walter was born November 3rd, 1926, in Ithaca, NY. The son of Brigadier General Paul Vincent Kane and Lillian Reilly. A true "Army brat", Walter spent his boyhood in many places due to his father's military career: US Military Academy, West Point, NY, Washington, DC, Fort Stotsenburg in the Philippines, Norman, OK, Carmel, CA and Corvallis, OR. At 17, he worked for the U.S. Forest Service, Camp Hebo, Oregon on a fire suppression crew. He enlisted in the US Army on his 18th birthday, completing basic training just as WW2 ended. He stayed on receiving training in surveying while chosen through the ASTP program to attend Stanford University for engineering. He chose physics over engineering as the building was climate-controlled and significantly improved his perennial hay fever, earning a B.S. in Physics in 1949. While working a short stint at the National Bureau of Standards, doing research in atomic and molecular physics, he attained his M.S. from the University of Washington in 1951. It was at Los Alamos National Laboratory that he met Margaret Gunn. They were married in 1953. Together they mountain climbed, skied and folk danced. In 1955 they moved to Cambridge, MA where he attended Harvard University, attaining his PhD in physics in 1959, while she earned her Master’s in Public Health. In 1956-57 he worked part time for AVCO Mfg. Corporation developing diagnostic instrumentation for shock tube experiments. In 1958 he joined the Physics Department at Brookhaven National Laboratory. He conducted extensive research in experimental nuclear physics with a focus on neutron and gamma ray spectroscopy, writing over 60 peer-reviewed publications and designing and constructing two experimental facilities. 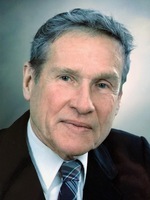 He was made a Fellow of the American Physical Society in 1969. In 1982 he transitioned to the Safeguards and Arms Control Division, Department of Nonproliferation and National Security, also at Brookhaven National Laboratory. In that capacity he did extensive work in nuclear safeguards, arms control and nuclear non-proliferation. His development of a Xenon Gamma Ray detector replaced more cumbersome radiation detection devices. Having a good understanding of the Russian language, he was heavily involved in the cooperative program between the U.S. and Russian Federation for upgrading the accounting, control and physical protection of nuclear materials at Russian facilities, necessitating many trips to Russia. Being able to toast his Russian collaborators in their native language after being on opposite sides during the Cold War was a moment he never forgot. In 2016, he was made a Fellow of the Institute of Nuclear Materials and Management, for his nearly 70 years of contributions to the nuclear profession, from its infancy to the present day. In 2000, Walter added another career, teaching Physics, Chemistry and Russian Language at the Marvelwood School in Kent, Connecticut. He was much admired and loved by both students and faculty for his endless source of facts on a myriad of subjects, his boundless energy (he used to snowshoe to work on occasion), abundant humor and kindness to each and all. Not only was he proficient in Russian but he was also an Irish Gaelic speaker as well as having a smattering of many other languages. If he knew your nationality he would thank you in your native tongue. Wherever Walter was he always had a vegetable garden and some fruit trees. He took over the maple syrup operation that his mother-in-law had started in the 1930s, in 1958, only missing two seasons- once, when he spent a year working in Grenoble, France and once when he and Margaret both had Lyme disease. In the early 1960s Walter built his own canoe and spent many happy times on canoe camping trips in the wilds of Quebec, Ontario, Maine and the Adirondacks. Walter had a great interest in the Native American conflicts of the American West, doing extensive research on Colonel Crook and the Sibley Scout, long before Internet access, finally retracing their route up in the Bighorn Mountains on a solo backpacking trip. Walter was known for his dancing expertise, teaching ethnic folk dancing for years, and later patiently teaching "Waltzing with Walter" to prenuptial couples and others trying not to step on each other's feet. Walter was predeceased by his wife of 60 years, Margaret, and a brother, William Spooner Kane. He is survived by his daughter, Dr. Katherine Skiff Kane, of Kent, his brother, Dr. John Power Kane and sister-in-law, Dr. Mary Malloy, of Hillsborough, CA and his caregiver, whom he considered an honorary daughter, Grace Kyeremateng, numerous nieces and nephews, as well as his beloved Corgi, Colby and cat, Sheeba, both of whom accompanied him for hours in the woods, when he was able. Walter's amazing mind will be greatly missed. The family wishes to thank Sharon Health Care. A memorial celebration will be held late this summer on the campus of The Marvelwood School. To send Dr. Kane’s family an online condolence, please visit www.hufcutfunerahome.com. To send flowers to the family of Dr. Walter Reilly Kane, please visit our Heartfelt Sympathies Store.